If we look at the Major scale and its three cords we find the similar 6-note scale common to the three cords, except starting on the C, F and G.
Even though you are using the same pattern, because you are starting on a different note you will get an entirely different sound! Now you will be able play in the Major key of C in the same way you played over the minor chords. The b3 is useful here and gives the same effect that the b5 did in the A minor scale. 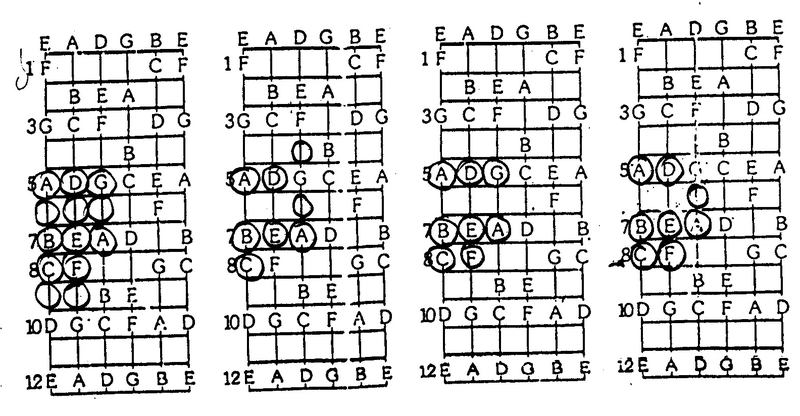 Because songs do not always use just three chords, we need to know our other five positions. 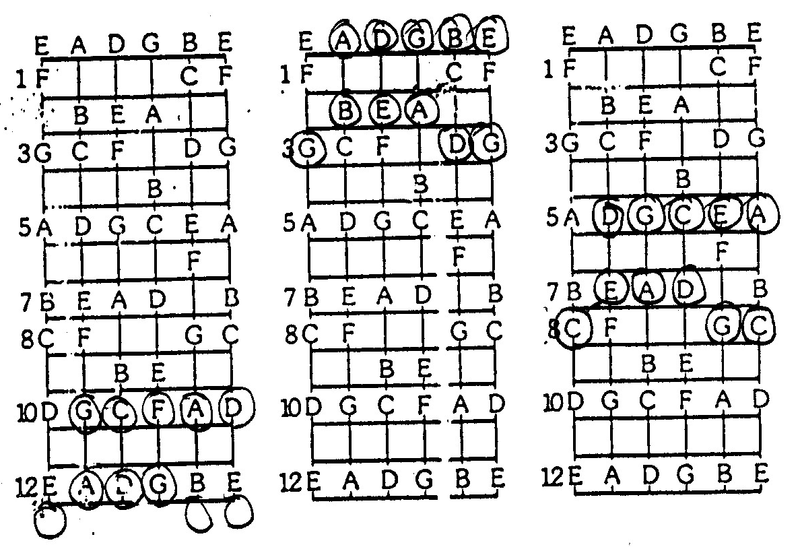 We also need to learn the seven starting positions for each chord we looked at earlier, this takes a little time. It is important to know that the third in popular music is often ambiguous. This means that we play minor and Major at the same time. If your playing in A minor you will play A Major as well. This will take time to understand and to introduce into your playing. Listening to music will be a big help. The effect is quite nice and it will be a really good discovery when you get it. Below is the same information for A Major so you can mix it in with your A minor licks. Some songs will be modal, or centre on a different starting position other than C or Am. If we are in the key of C and the song centres around G Maj we are playing G mixolydian mode, the name given to this particular scale or starting position. This is a particularly useful mode in rock music as many good songs use it! If we are using this scale as our sound center the three chords would change to G, C Dm, I, IV and V. If you centered the song on D minor in the key of C, the main chords would be Dm, G and Am, I, IV and V.
When we talk of having an ambiguous third and playing Maj and minor simultaneously my first choice is to use the Dorian mode for minor and the Mixolydian mode for Major. In rock music the guitar will often be playing the pentatonic minor and the bass will play the Mixolydian Major. This is an easily identifiable way to hear the minor/Major playing simultaneously. You can make different sounds by using other notes. If you use them all we call that a chromatic scale. Classical music convention employs a melodic minor scale on the way up and a natural minor scale (the one we know) to go down, giving it a unique sound. Another good tonal change is the harmonic minor scale as mentioned earlier.